We are the #1 authorized ticket seller for Universal Islands of Adventure tickets. Where else can you take an unforgettable journey through the world’s most cutting edge rides, shows and interactive attractions? Only at the unique Universal’s Islands of Adventure! 5 Park Orlando Flex – visit Universal Studios, Islands of Adventure (CityWalk included) and SeaWorld + Aquatica for 14 consecutive days! Hot Deal! 6 Park Orlando Flex – visit Universal Studios, Islands of Adventure (CityWalk included) and SeaWorld, Aquatica, + Busch Gardens for 14 consecutive days! One of the best deals going for Universal Orlando tickets for longer trips is the Three-Park Unlimited Ticket. It’s a 14-day park-to-park ticket that provides unlimited admission to Islands of Adventure, Universal Studios Florida, and Wet ‘N’ Wild Orlando. You can visit any of the three parks as often as you want for 14 consecutive days. The list price for this is $260.91 (tax included) for adults, $250.26 for children, which is just a few dollars more than the gate price for a 4-day park-to-park ticket. *If you plan to visit Wet ‘N’ Wild (which is about $50 per person per day), or want to spend more than 4 days in the Universal area, this ticket is a very good deal. The Three-Park Unlimited Ticket is only sold in advance. Note: this ticket cannot be upgraded, for example to an annual pass. Save $21.30 (tax included) off the gate prices of multi-day tickets when you buy online at the HotelsCorp Hotel ticket desk. When purchasing online you can print them yourself or use electronic pickup (go to the park and get them out of a machine) and avoid shipping charges. Prices displayed on Universal’s site do not include 6.5% tax, which is added further along in the transaction. This deeply discounted Annual Pass has blackout days (mainly Christmastime and Spring Break at both parks and most of the summer at Islands of Adventure) and does not include parking or food/merchandise discounts. You can order it online at the Universal Studios website. *Florida residents pay a lower price. Holders of any Universal Annual Pass, including the Power Annual Pass, get 10% off the gate price of multi-day tickets when purchasing at the front gate. For most tickets, this is less than the regular advance-purchase discount for buying online. There is no discount for 1-day tickets. All AAA (American Automobile Association) and CAA (Canadian Automobile Association) members can save $4 on a 2-Day/2-Park ticket and $5 off a 3-Day/2-Park ticket when purchasing tickets at the gate. *Valid for up to six people per membership card. Auto Club South offices in Florida, Georgia and western Tennessee allow AAA members from any region to purchase discounted Universal tickets on a walk-in basis (no phone orders). The nearest office is located at 7339 West Sand Lake Road, Suite 424 in Bay Hill/Orlando. Call (407) 351-5610 for hours and directions. (They also have a website, but only Auto Club South members can order online, and the prices are sometimes higher online.) *Note that sometimes there is a delay of up to several days to get tickets, depending on the specific tickets you need, so definitely call ahead to make sure they have tickets in stock before showing up at their office. Planning a “grand tour” of Orlando? Be sure to consider the Orlando FlexTicket, which includes 14 days of unlimited admission to both Universal and Islands of Adventure and CityWalk, plus several other attractions. Universal often has special ticket promotions for local residents. Students, faculty and staff at University of Central Florida can purchase 1-Day/1-Park, 2-Day/2-Park and 1-Day Park-to-Park Universal Orlando tickets at a significantly reduced rate. There is a limit of 2 tickets per 30 days. Tickets can be purchased through the SGA Ticket Center located on the first floor of the Student Union in the Lighthouse Mall area. *Be sure to buy in advance because they do sell out at times. If you have the type of American Express charge card that earns Membership Rewards points, you can sometimes redeem those points for Universal Orlando tickets (availability comes and goes on the Amex site). You can exchange Hilton HHonors points for select Universal Orlando tickets. Click here to read about this award (choose country, then Gift Cards & Certificates, then Universal Theme Parks). You can redeem Southwest Airlines Rapid Rewards points to purchase adult or child 1-Day Park-to-Park Universal Orlando tickets on the Rapid Rewards site. The Chase Ultimate Rewards program has Universal Orlando tickets as an award option. Canadians can redeem Aeroplan Miles for select Universal Orlando tickets. *Power Annual Pass has blackout days (mainly Spring Break and Christmastime at both parks and most of the summer at Islands of Adventure). Includes discounts at on-site resort hotels. *Not valid for separately ticketed special events. Does not include parking or food/merchandise discounts. There are frequent deals on this pass. **Preferred Annual Pass allows admission every day to both parks for 365 days. Not valid for separately ticketed special events. Includes free self-parking, half-price valet parking, food and merchandise discounts, discounts at on-site resort hotels and more. *Florida Resident price may be lower. ***Premier Annual Pass allows admission every day to both parks for 365 days, plus Unlimited Universal Express Plus after 4:00 pm. Not valid for separately ticketed special events. Includes free valet parking or preferred self-parking, free bottled water (up to 8 bottles per year), one ticket to Halloween Horror Nights, food and merchandise discounts, discounts and upgrades at on-site resort hotels and more. Each guest receives one table-service meal, one quick-service meal, one snack, and one additional non-alcoholic beverage. A table-service meal consists of an entrée, a non-alcoholic beverage, and a pre-selected Dining Plan dessert. A quick-service meal consists of an entrée platter and a non-alcoholic drink. A snack is an ice-cream, popcorn, fruit, churro, frozen beverage, or a few other options. Gratuities are not included. Children must order one of the available designated children’s entrées. All restaurants and snack locations inside both parks participate in the program, as well as two CityWalk restaurants: Bob Marley-A Tribute To Freedom and Pat O’Brien’s. No resort restaurants participate. Provides you one quick service meal (1 entree and 1 beverage) plus a snack and another beverage. The Quick Service option costs $19.99/day for adults and $12.99/day for children. The Quick Service Option is available to anyone, whether they book a package or not, but it’s usually not a bargain of any kind, unless you go out of your way to find the absolute most expensive items for every meal and snack. You can purchase the Quick Service plan at any time, at any quick service location in the park, so you can wait and buy it only if it saves you money. If you should happen to be buying an entree and beverage at a quick service restaurant with a total price that is within a few dollars of the Quick Service Dining Plan price, you can buy the plan and use it immediately, thus getting a snack and drink credit to use later. For example, if you get the Rib Platter at the Three Broomsticks or the Basket O’ Bait seafood platter at the Frying Dutchman for $13.99, plus a large drink for $2.99, the total is $16.98. If you buy the Quick Service plan for $19.99, you can use it for your platter and drink and end up with an extra drink and snack for a net $3.01 plus tax, which is a pretty decent deal. It’s an even better deal if you use it to get the fisherman’s pie at the Leaky Cauldron for $14.99 or the rib platter at the Classic Monsters Cafe for $15.99. (There are very few entrees priced that high at locations that participate in the plan). (Certain items are excluded from the plan; be sure to ask whether your entree will qualify before you purchase the plan.) *If your entree is priced at $13 or more, you will definitely save if you buy it ticket via the Quick Service plan, (if you purchase a snack and drink at some point over the rest of the day). 10% off Universal Orlando CityWalk restaurants and shops. (Offer excludes merchandise or food carts, tattoos, alcohol, tobacco, candy, film, collectibles or sundry items. Discount on food, non-alcoholic drinks and merchandise at all CityWalk restaurants and shops with the exception of Emeril’s, Bubba Gump, Fossil and Fresh Produce.) *Valid up to six people per AAA membership card. Show your membership card to get the discount. If you leave and return on the same day, present your parking receipt and you won’t have to pay again. Self-parking is substantially cheaper after 6:00 pm (except on special event nights) and FREE for Florida residents after 6:00 pm. This is primarily intended for those planning to eat/shop/go to a movie in CityWalk, but you can, of course, go into the theme parks if they are still open. Would you like some very specific help with picking the best dates for your Universal vacation and then avoiding lines once you arrive? When you buy a very inexpensive annual subscription to TouringPlans.com for Universal Orlando, you’ll receive computer-optimized touring plans provide personalized, step-by-step guides that can be altered on the fly for experiencing Universal Orlando’s attractions in the most efficient order, without long lines. Customize your plans with rides, meals, breaks, and character greetings, and save hours seeing the Wizarding World of Harry Potter! For 2016, Mardi Gras at Universal Studios will be offered on select nights between February 6- April 16. The main attraction is a parade with authentic floats, which usually starts about 8:00 pm. Beads are thrown to the crowd at this family-friendly event. →Link to performances After the parade there is a concert. Click here to check for the latest list of performers. Cajun food is available for purchase on Mardi Gras nights. During the Mardi Gras parade, most or all of the attractions are closed. Mardi Gras festivities are included in the regular price of admission to the park. Halloween Horror Nights (HHN) is an after-hours event at Universal Orlando that is held on selected nights in late Fall-usually Friday, Saturday and most Sunday nights, plus Halloween night and sometimes a few weeknights. 2016 the Halloween Horror Nights will be held on select nights September 16-October 31. @Travel Tip: Only Park-to-Park Tickets will allow you to travel on the Hogwarts™ Express* to visit BOTH The Wizarding World of Harry Potter™ – Hogsmeade™ and Diagon Alley™ in a single day! 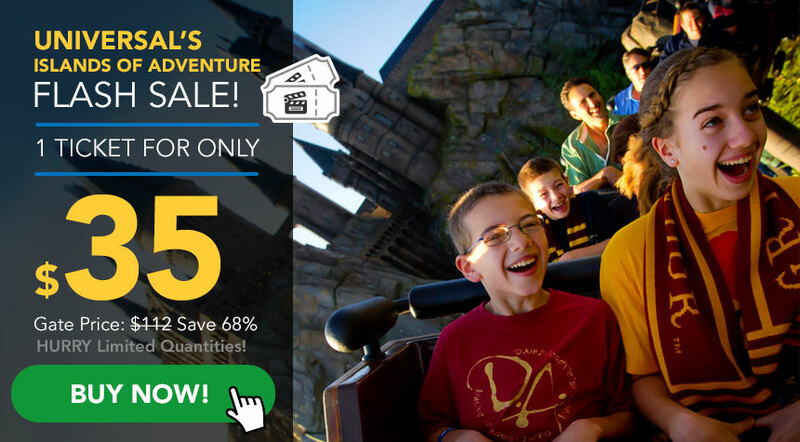 All multi-day base tickets grant access to Islands of Adventure and Universal Studios, and one park per day. Ticket is valid for the number of days purchased during a fourteen (14) consecutive calendar day period which commences on the first day of use. Admission to the paid entertainment venues of Universal CityWalk is also included during that same period.